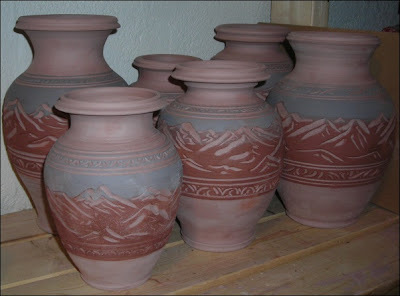 Luke Langholz Pottery: Vases Galore! Hey there folks! I'm all done with potting for this year of 2010, I think. There is the very odd chance that there may be a little something thrown next week, but not likely. Anyhow, here there be the representations of what I got up to this week. A boatload of little white vases! Been working on some large vases. It's pretty fun! I'm pretty excited about this big boy! And here's a bowl that was fun. Have I mentioned these little beauties? Anyhow, that's the news from me. More in the New Year, certainly, including perhaps the year in review, and maybe this year I'll actually get my best music of 2010 reviews up! In the meantime, thanks for following along and have a very Merry Christmas and a Happy New Year!